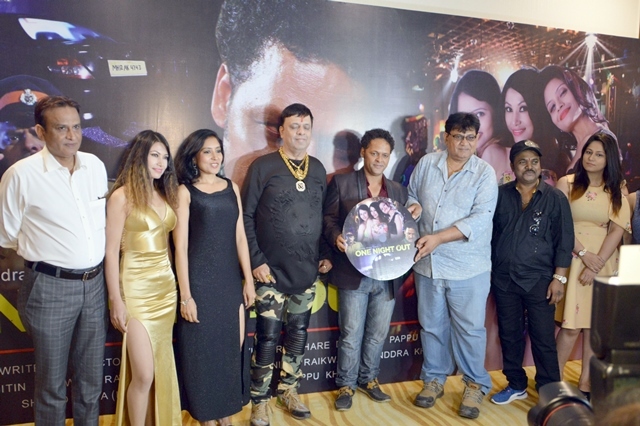 Music of Hindi Feature Film “One Night Out” was released on 14th April 2018, at The View, Andheri West, by Film Financer Ajay Gosalia, where in entire cast and crew were present. Every one praised the melodious music, basically the subject which is based on a true story. Film is a suspense thriller on three innocent teenager girls who go for a Night Out Party, and get trapped in a critical situation, the story of Film is unusual, which is never seen before. Film stars Javed Haider, Kabina Maharjan, Neha Joshi, Avantika Mishra, Gulshan Pandey, Krishna Bhansal, Shazida Khan, Yogi Mane, Mayra Singh and others. Film is made under the banner of ‘Music One Films Production and Studio’, film is produced, written & directed by Ravinddra Khare, DOP by S Pappu, lyrics by Nitin Raikwar, Shahid Baba (London) and Ravinddra Khare, music by Nitin Raikwar & Ravinddra Khare, choreography by Pappu Khanna, editing by Rajkumar Singh and singers are Shahid Baba (London), Madhushree, Nitin Raikwar, Ramshankar, Tarrunnam, Shivam, Khushoo Jain, Trapti Sinha, Akansha Pathak, Kusal etc. Film is releasing all india on 25th May 2018.